When Do Ring-Enhancing Brain Lesions Need to Be Biopsied, and Should They Be Treated Empirically First? Other than acute cerebrovascular accidents, multiple ring-enhancing lesions are among the most common lesions encountered in neuroimaging. 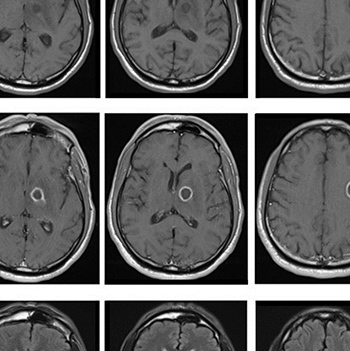 We herein describe the case of a 63-year-old diabetic man presenting with altered mental status, hyperglycaemia and community-acquired pneumonia who was found to have two ring-enhancing lesions involving the left frontal lobe and left basal ganglia. The lesions were biopsied to reveal positive fungal cultures and toxoplasma cysts. RPR titres returned reactive for non-treponemal antibodies and a suppressed CD4 count was found without evidence of HIV infection. Mahato PS, Dabhi AS, Thorat PB. Clinical and investigative profile of ring-enhancing lesions on neuroimaging. Indian Journal of Clinical Practice 2012;22:512–518. Garg R, Sinha M. Multiple ring-enhancing lesions of the brain. J Postgrad Med 2010;56:307. Chen S, Pu J-L, Yu J, Zhang J-M. Multiple Aspergillus cerebellar abscesses in a middle-aged female: case report and literature review. Int J Med Sci 2011;8:635–639. Sessa A, Meroni M, Battini G, et al. Nosocomial outbreak of Aspergillus fumigatus infection among patients in a renal unit? Nephrol Dial Transpl 1996;11:1322–1324. Gutiérrez-Cuadra M, Ballesteros-Sanz MA, Vallejo A, Miñambres E, Fariñas Alvarez C, García-Palomo JD, García-Palomo JD, et al. Brain abscess in a tertiary medical center: epidemiology and prognostic factors related to mortality. Rev Española Quimioter 2009;22:201–206. Use THIS recommended model of case report and READ the Editor-in-Chief's recommendations before submitting!